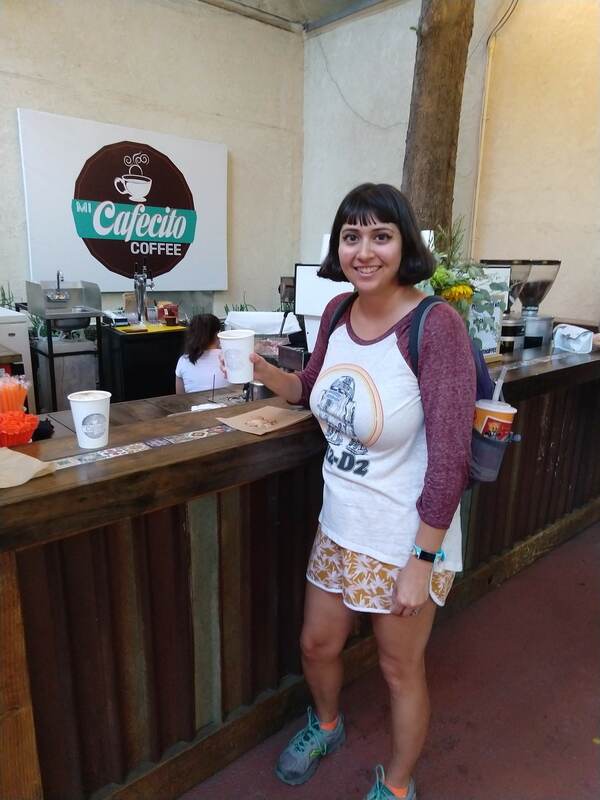 I was so excited to sample Mi Cafecito at the fair since I’m never in the Downtown Pomona area to pop into their cafe. It was delicious. I’m definitely making the trip now! 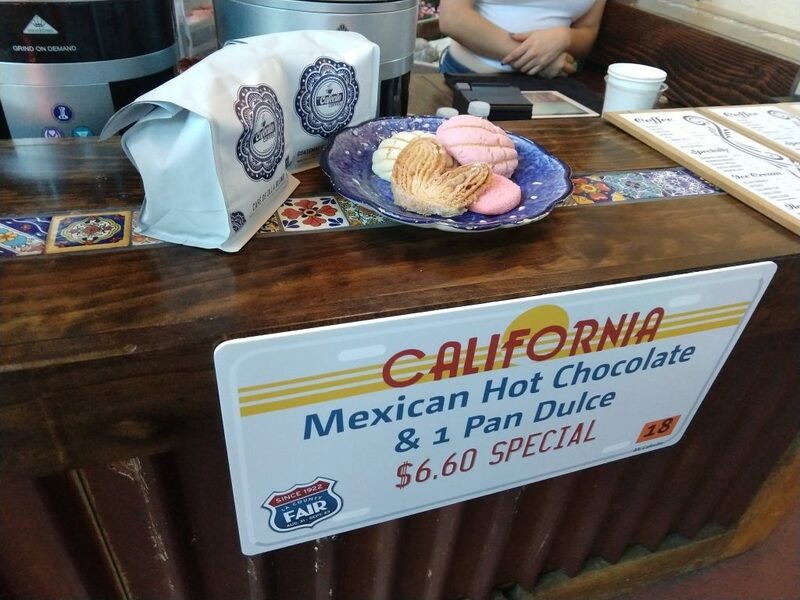 Overwhelmed with the prospect of ordering a horchata latte, or cafe de olla, I settled on something tried and true: their Route 66 special — Mexican hot chocolate and a pan dulce (Mexican sweet bread) for $6.60. At the last minute I remembered to ask for almond milk. Surprisingly, the barista also suggested Oat Milk. Oat Milk? That’s new. I have had numerous milk alternatives at other coffee shops: soy, almond, and coconut – but never oat. I declined for now, but plan on learning more about it later because I love oatmeal. Speaking of oatmeal, I was curious to find out if Mi Cafecito had this Mexican specialty oatmeal drink, Avena. It is basically oatmeal blended to drink on the go with a cinnamon stick on the bottom of the cup. I had to ask another patron what it was called in Spanish, but the cafe doesn’t offer it. That’s fine, I said, let’s go with the Mexican hot chocolate as planned. My sister ordered her hot chocolate with regular milk, which produced a gorgeous swirl in her drink. My latte art looked like a fuzzy version of hers and the barista sheepishly apologized, explaining that the almond milk doesn’t come out as pretty as regular milk. I didn’t care. I sipped and felt a delicious milky chocolateness flowing throughout my whole body. I instantly flashed back to my mother grating Ibarrra chocolate and warming the chocolately ribbons with milk in a pot on our gas stove. Back in present day, it was about 80 degrees outside, but the chocolate was soothing and relaxing on a hot, end-of-summer evening. It was a tough choice between which pan dulce I wanted. My sister went back the following week without me and the sweets available included my favorite pan dulce, the piggy. I bit into my pan dulce. Mi Cafecito doesn’t make the pan dulce in house, only the coffee. I was given an option of three varieties: a Concha, a Orejita, or a Polvorones. An Orejita is a heart-shaped puff pastry, a Polvorones is bright pink cookie, and a Concha (probably the most recognizable of the bunch) is a sweet bread roll with a sugary topping that resembles a shell. I chose the orejita. It was a little crisp on the outside when I bit into it and my sister explained that it’s probably meant to be dipped in the hot chocolate. Sadly, this area of the fair is only open after 3 p.m. on Fridays – Sundays and I had a chance to visit it once during operating hours. A female singer with just her guitar played beautifully in the Mi Poco L.A. square. She started singing “Hotel California” by the Eagles and I was probably the only person singing along. But it didn’t matter, I had my hot chocolate in one hand and an orejita in the other and it was a perfect evening. 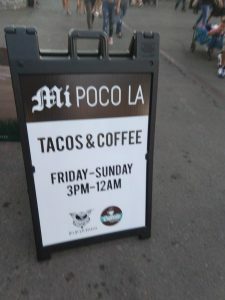 My sister and I finished sipping, and with a satisfied sigh, gathered our backpacks and walked away from the square to see what other goodies the fair had waiting for us. 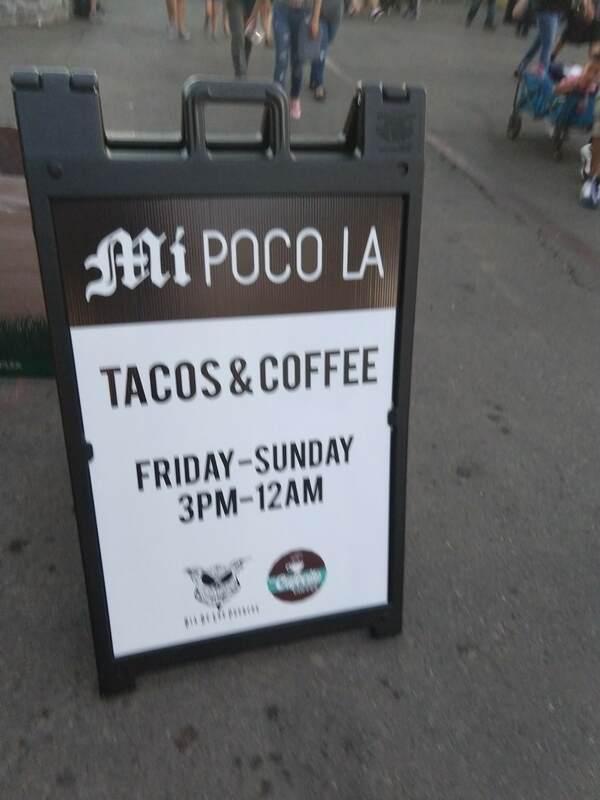 For more information on Mi Cafecito, visit their Facebook page.